I often share the story of Herb Brooks from the movie "Miracle" in which his assistant is puzzled as to why Herb isn't keeping the "best" players for the USA hockey team. Herb replies that he isn't looking for the best players, he's looking for the "right" players. To me this is the secret of recruiting. 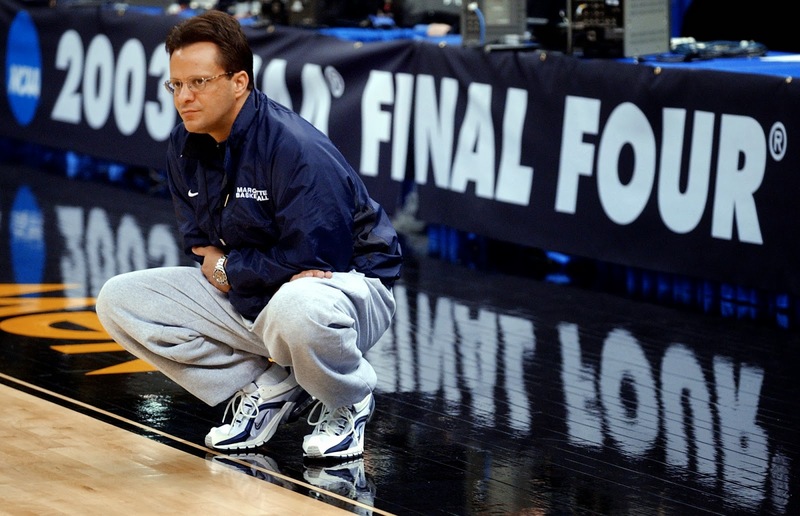 And it's why I enjoyed this article written by Pete DiPrimio of the News-Sentinel on Tom Crean and how Indiana University approaches recruiting. Kenny Johnson knows all about it. 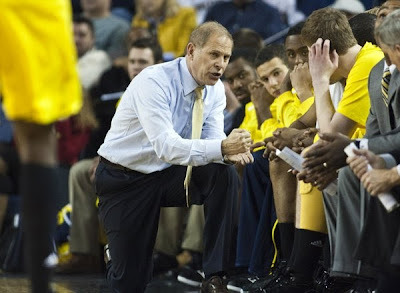 He's Indiana's assistant coach, recruiting coordinator and Crean's right hand man in the never-ending quest for talent. He understands the truth behind the drama. So what is the state of IU recruiting now that the program has regained national acclaim? “It's a weeding out process,” Johnson says. “Coach Crean has always tried to recruit from a position of power. We can't talk specifics about recruiting, so people might not understand the method to the madness, but it has never been about the credential of the player. It's always been about the fit. Understanding what you need. What your vision is, and how you want to continue building the program. Here is the article in it's entirety. It wasn't by accident that Peyton Manning threw passes to five different Denver Broncos teammates in the opening drive of the Broncos' game Monday against Oakland. Manning said Wednesday that spreading out his passes to his receivers, tight ends and running backs isn't just about trying to fool an opposing defense. It's also a motivational trick to keep each of his teammates engaged. "I know it helps all the offensive players. When everybody on the offense on any given play thinks the ball might be coming to them, you just run better routes," Manning said. "On certain plays, if you're only throwing to the same guy every single time, there's four guys that might not be running full speed routes." 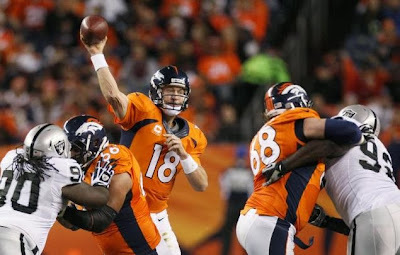 "Our distribution has been pretty good so far, in terms of spreading the ball around, so that's why we have guys getting open, because all five guys think they might get the ball on this play," Manning said. "That can put pressure on a defense, I would think." Decker was the last of Manning's top targets to get hot, and that came Monday when he had eight catches, 133 yards and his first touchdown of the season. "Any given play, it doesn't matter which read you may be on that play, [Manning] might come to you," Decker said. "You run every route to win, and you expect the ball in the play." 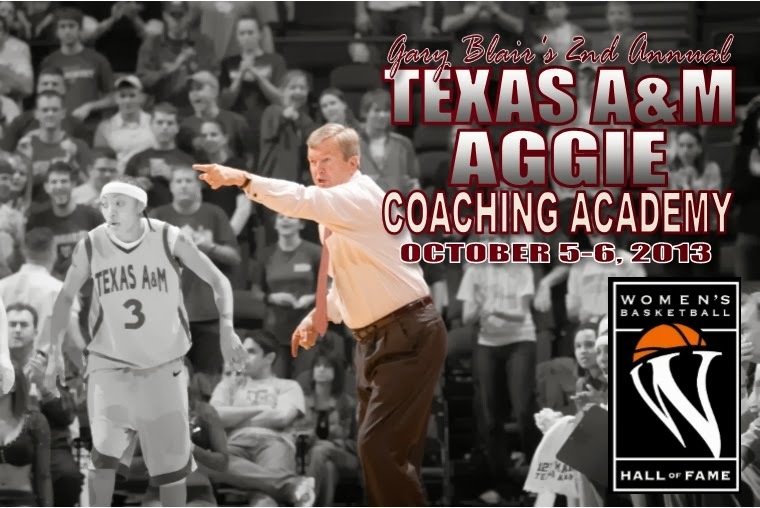 The following is one of our favorite "Disadvantage Drills" and will be one of the drills we take a look at during the Gary Blair Coaching Academy October 5-6. DRILL SET UP: Drill is set up 4/4 with two additional offensive players in each corner (Diagram #1). Early we can have the offense remain stationary . We can add movement without screening and then add screening later. EXECUTION: The offense is looking to score with either of their four players. The “open players” may only receive a pass outside the arc. When she receives, she is to drive the ball to the rim for a lay-up (Diagram#2). If the defense stops her, we want her to hit a teammate on the offensive team and continue play. The “open player” may go to the boards if she is outside the arc when it is shot. Make it/Take it and keep score. VARIATIONS: Variations can obviously come by the offensive movement as mention above...we can also dictate early movement before going “live” such as down screening off the guard to guard pass to work on this phase of our game...we could start with a double-staggered before going life. Variation can also come in the form of scoring. We can keep points score but also penalize the offense for a turnover and the defense for allowing a paint touch. ◄We are looking to play a base man-to-man defense...we want active pressure on the ball looking for tips...in the passing lane a pass away ballside...good post defense...jump to the ball when passed. 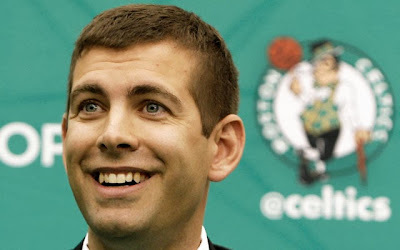 ◄We are also looking to work on our rotation with the “I” on all baseline drives. ◄Key emphasis is on “early help” — closest player to the ball helps (with the exception of ballside help) and we want to stop the ball before it gets to the paint. ◄We are looking to contest all perimeter shots and finish with a blockout. Today marks the 5th anniversary of Hoopthoughts. When I first started I was simply looking for a way to share a few ideas with other coaches and learn a little on the way as well. I had no idea that it would grow at the rate that it has with well over 1,000 visitors per day and nearly 1,400,000 total. I am so thankful for all the notes, email, texts and comments in regard to the blog and especially to all those who share info for me to use. Per our tradition, today I will repeat my first blog post of 2008 -- which comes from my friend Don Yaeger. It remains one of the most visited posts we have had -- and with good reason. It was itself a blog post for Don that grew into a best-selling book. 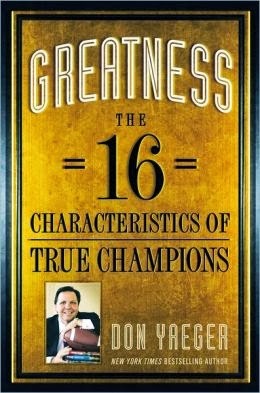 Well this is my first entry (and first attempt at blogging) so I thought I would go over 16 CONSISTENT CHARACTERISTICS OF GREATNESS. These come from writer Don Yaeger and I received them via email from Dale Brown. HOW THEY THINK1. IT’S PERSONAL...they hate to lose more than the love to win. 2. RUBBING ELBOWS...they understand the value of association. 3. BELIEVE...they have faith in a higher power. 4. CONTAGIOUS ENTHUSIASM...they are positive thinkers...they are enthusiastic...and that enthusiasm rubs off. 5. HOPE FOR THE BEST BUT...they prepare for all possibilities before they step off the field. 6. WHAT OFF-SEASON?...they are always working towards the next game...the next season...the goal is what’s ahead and there is always something ahead. 7. VISUALIZE VICTORY...they see victory before the game begins. 8. INNER FIRE...they use adversity as fuel. 10. WHEN ALL ELSE FAILS...they know how and when to adjust their game plan. 11. ULTIMATE TEAMMATE...they will assume whatever role is necessary for the team to win. 12. NOT JUST ABOUT THE BENJAMINS...they don’t compete just for the money. 13. THEY DO UNTO OTHERS...they know character is defined by how they treat those who cannot help them. 14. WHEN NO ONE IS WATCHING...they are comfortable in the mirror...they live their life with integrity. 15. WHEVER EVERYONE IS WATCHING...they embrace the idea of being a role model. 16. RECORDS ARE MADE TO BE BROKEN...they know their legacy isn’t what they did on the field...the are well-rounded. If you want to be a better communicator or a better leader, you can’t depend on dumb luck. You must learn to connect with others by making the most of whatever skills and experience you have. When I listen to great communicators, I notice that there are a handful of factors they seem to draw upon that cause people to listen to them. One of the quickest ways to gain credibility with an individual, a group, or an audience is to borrow it from someone who already has credibility with them. It’s the basis of sales referrals and word-of-mouth advertising. “Who” you know can open the door for you to connect with someone. Of course, once the door is open, you still have to deliver! Most people want to improve their situation in life. 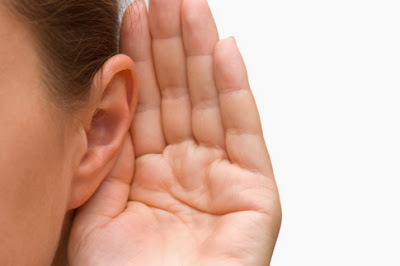 When they find someone who can communicate something of value, they will usually listen. If what they learn really helps, a sense of connection between them can often quickly develop. America has a success culture. 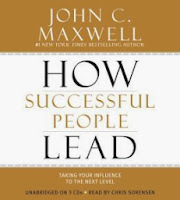 People want to be successful, and they seek out others who have accomplished something to get their advice. If you are successful in anything you do, there will be people who will want to listen to you. Individuals who perform at a high level in their profession often have instant credibility with others. 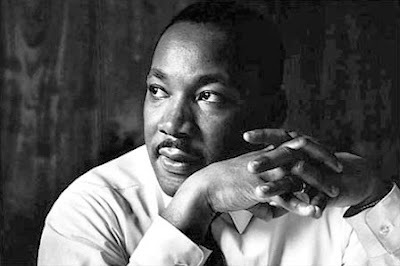 People admire them, they want to be like them, and they feel connected to them. When they speak, others listen—even if the area of their skill has nothing to do with the advice they give. Mother Teresa had the respect and the ear of leaders around the world. People of all faiths seemed to admire her. Why was that? Why did they listen to her—a poor, diminutive schoolteacher who lived in the slums in India? Because of the life of sacrifice she lived. Do shell defense drill with the dribble. The following comes from the book "Trust Works" by Ken Blanchard. 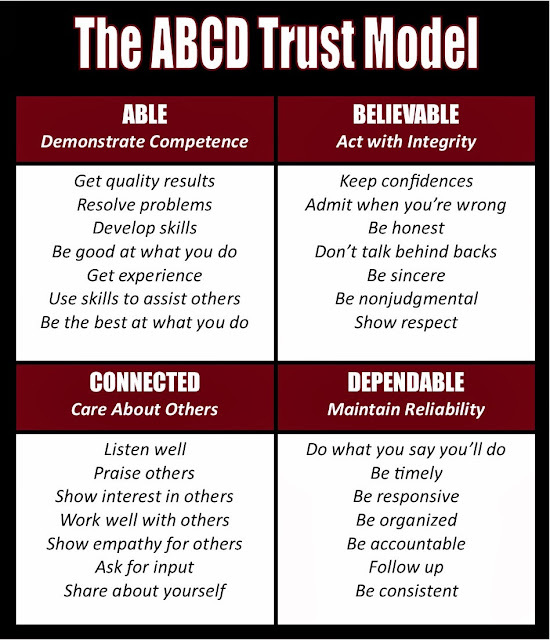 It is a passout that we will give to our team next week and talk about the qualities of trust and how it can impact a team. "In a real sense, all of life is interrelated. All persons are caught in an inescapable network of mutuality, tied in a single garment of destiny. Whatever affects one directly affects all indirectly. I can never be what I ought to be until you are what you ought to be, and you can never be what you ought to be until I am what I ought to be. This is the interrelated structure of reality." Good leadership begins with leaders knowing who they are. Successful leaders work hard to know themselves. They know their own strengths and weaknesses. They understand their own temperament. They know what personal experiences serve them well. They know their work habits as well as their daily, monthly, and seasonal rhythms. They know which kinds of people they work well with and which kinds they have to try harder with to appreciate. They have a sense of where they are going and how they want to get there. As a result, they know what they're capable of doing, and their leadership is steady. Ethical Values -- what does it mean to do the right thing for the right reason? Relational Values -- How do you build an environment of trust and respect with others? Success Values -- What goals are worth spending your life on? 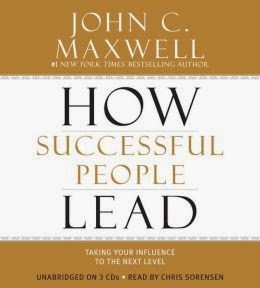 What Leadership Practices Do I Want to Put into Place? If you want to become a successful leader, you must not only know yourself and define your values, you must also live them out. You will not grow as a leader unless you commit to getting out of your comfort zone and trying to be a better leader than you are today. Gives kids a sense of achievement when they improve. Press, zone, man, half court, full court, guards, bigs, etc. Know mom, dad, brothers, sisters, names, etc. Coach Beilein incorporates Cazzie Russell and Glen Rice “spots on the floor.” Helping to create the culture while recognizing the past players who have helped pave the way. And it is strategically sound information. Glenn Rice is 28 feet from the rim on the wing, and Cazzie Russell is in the corner. 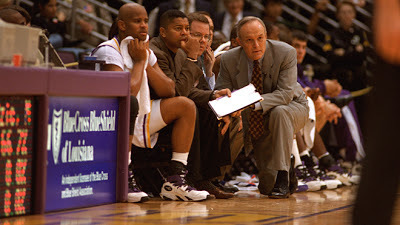 The following piece on Coach Dale Brown was written by my friend Kent Lowe which is fitting as he is the long-time men's basketball SID at LSU and was with Coach Brown the large majority of his career with the Tigers. It is one of the most well-written articles on Coach in terms capturing both who he is as well as what he has accomplished as a coach. When you are done reading this -- I hope you are as amazed as I am why Coach Brown isn't in the Naismith Hall of Fame for his accomplishments. Great job Kent! Where does one begin in telling the story of a coach like Dale Brown? Many parts of that story will be told Friday night when he becomes the latest in the Head Coach/Administrator category to be inducted into the LSU Athletic Hall of Fame. This year he is the second inductee from the sport of basketball joining 1940s star Frank Brian. He becomes the 11th overall inductee at LSU from the sport of men’s basketball. Brown took over a struggling LSU men’s basketball program in 1972 and built it into a consistent winner that played in front of sell-out crowds in the Pete Maravich Assembly Center. He led the Tigers to Final Four appearances in 1981 and 1986, along with two other NCAA Elite Eight appearances (1980, 1987) and one more Sweet 16 berth (1979). 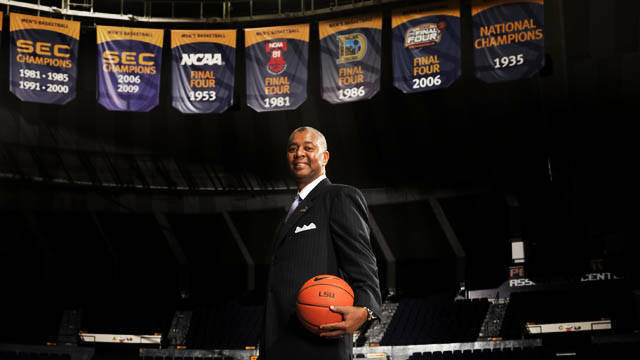 He built a powerhouse program in the SEC, winning league titles four times (1979, 1981, 1986, 1989) while taking LSU to 13 NCAA Tournament appearances. 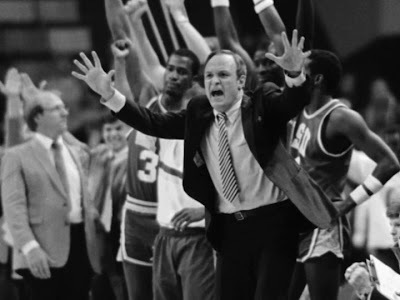 Brown was named National Coach of the Year in 1981 when the Tigers won an SEC title and stormed to the Final Four in Philadelphia. In 1986 his Tigers stunned the college basketball world when he took a Cinderella team from an 11th seed in the NCAA Tournament to a Final Four berth in Dallas. There you have the superficial story of Brown’s LSU career. This native of Minot, N.D., born on of all days, Halloween in 1935, was a four-sport athlete at St. Leo’s High School that earned him a scholarship to Minot State. He was the only athlete at Minot State to earn 12 letters (4 each) in football, basketball and track. Basketball playing led to basketball coaching but it would be a long and winding road for Dale Brown from his first head coaching job in 1957 at Columbus High School in Columbus, N.D., to head coach at LSU prior to the 1972-73 season. Carl Maddox was the LSU AD when a coach was being searched to replace Press Maravich, who was relieved of his duties after the 1971-72 season. 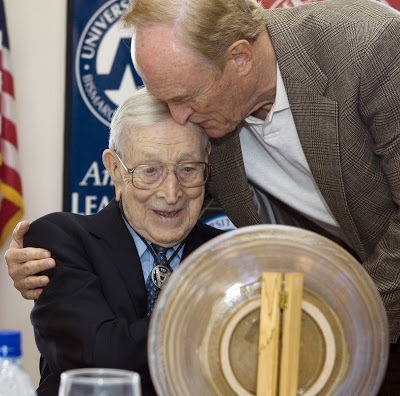 Maddox went after Bob Boyd, but after Boyd decided not to leave Southern Cal, he was one of the two people to recommend a young assistant named Dale Brown. The other was former LSU basketball player, television commentator and future LSU AD Joe Dean. His first salary was $23,000. Brown wrote in one of his books that he never asked his salary until he signed a contract. He came to Baton Rouge with three suits, a Volkswagen and $800 in cash. Brown would show us all in Louisiana that he wasn’t going to just be a basketball coach and nothing more. He was determined to be a salesman and a promoter of LSU basketball. 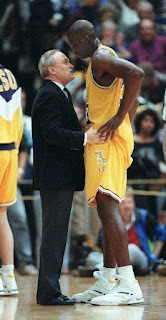 Coach Brown knew players were coming right away, but he knew he needed to promote the game of basketball in Louisiana. Brown found a company that manufactured purple and gold nets. His assistant’s wife, Janet Drew, wrote a poem about LSU basketball: “This is a net from the purple and gold for a sport that will never grow old.” The LSU staff headed out to all parts of the state and anytime they saw a basket, the group would stop and make sure the owners got a package with a purple and gold net. 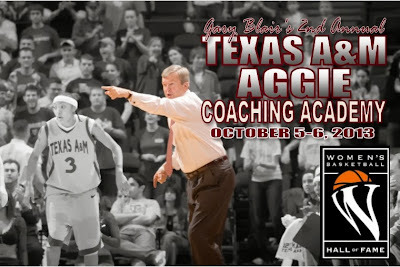 The first team Brown coached was expected to win two games in the SEC. One day in the post office Brown saw a wanted poster. From there came the idea of putting the team picture on a wanted poster that called the team “the Hustlers.” The team hustled and captured everyone’s heart. In the first home game, the Tigers beat Memphis, 94-81. Memphis would go on to play for the national championship at the end of the year. LSU would finish fifth in the league and 9-9 in the SEC. Brown received the honor as the SEC Coach of the Year. LSU basketball was well on its way. Well, not so fast. After winning 14 games the first year, the Tigers won no more than 12 games each of the next three years. Not only was Brown’s team struggling to win, but he was finding the recruiting world rather unseemly. 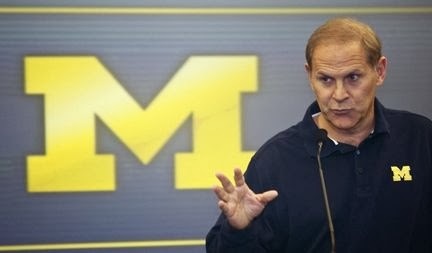 He was having second doubts about his ability to recruit honorably and get athletes to LSU. Brown was so frustrated he went to Athletic Director Carl Maddox and Chancellor Paul Murrill. He told them, “I’m just not sure I can get the job done with my philosophy.” Maddox told him that if he continued to do the job the same way and be disciplined in doing it, that Maddox would back him. The next year the Tigers had a winning season, and the rest is history. One of the first major wins for LSU came in Brown’s sixth season against Kentucky. The Wildcats were No. 1 that would go on to win the national championship. But it was the typical game where the underdog Tigers were prepared and fired up by their coach. All five starters had fouled out for LSU as the game went to overtime. But somehow, someway, the Tigers would win 95-94 and finished 18-9. Suddenly, LSU was getting national recognition. In 1979, the team would win the school’s first SEC regular season title in 25 years. Now everyone knew who LSU was and the Tigers were playing some of the best teams in the country. After winning the SEC Tournament title in 1980, Rudy Macklin, Greg Cook, Leonard Mitchell, Howard Carter, Ethan Martin and Willie Sims in 1981 would win 26 consecutive games which included 17 straight in the conference. The team made LSU’s first trip to the NCAA Final Four since 1953, and Brown was the National Coach of the Year. The Tigers of 1986 had one of the more remarkable rides of all the teams that have made it over the years to the NCAA Final Four. A team that started fast was struggling to win games in January and February while also forced to battle a chicken pox scare that forced LSU to play four games in five days. But LSU was given a chance to play in the NCAA Tournament and was seeded 11th. But the advantage was still on LSU’s side as the Tigers hosted the first two rounds in the then LSU Assembly Center. Higher ranked Purdue went down in double-overtime in the first round. 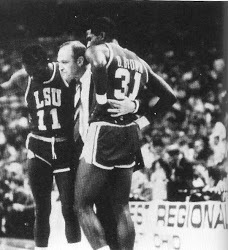 Two days later, the Assembly Center went nuts when Anthony Wilson picked up a loose ball and shot as the clock was running out to advance LSU to the regional finals. The Deaf Dome Magic was at its peak. But the run wasn’t over as LSU beat Georgia Tech to get to the regional semifinals. There waiting for Coach Brown and the Tigers was Kentucky, a team that had already knocked off LSU three times that year. Now there would be a fourth meeting for a spot in the NCAA Final Four. The team led by John Williams found help from Don Redden and bulked-up Ricky Blanton, who had been forced to move to the center spot and defeated Kentucky, 59-57, to get to another Final Four, this time as the lowest seeded team at that point in tournament history to make the Final Four. 448 wins (still to this day, second only to Adolph Rupp in the SEC). SEC Championships – 1979, 1981, 1986, 1991 (only 3 SEC coaches have won more). Member, Louisiana Sports Writers Association Hall of Fame. But the numbers don’t express the man himself. Brown is a person who once your friend, can and will be a friend for life. He has loved helping people. There have been times his style hasn’t pleased everyone, but it was just Dale being Dale. He was doing what he thought was best and letting his feeling find a spot on his sleeve. Brown coaches some of those special people who earned special post-season honors – Al Green, Rudy Macklin, Ethan Martin, Howard Carter, Chris Jackson (Mahmoud Abdul-Rauf), Shaquille O’Neal – but there were so many others who could have had A-A by their names who sacrificed for the good of the team in following Coach Brown’s beliefs. When Brown retired in 1997, he didn’t just fade away. It wouldn’t be his style. Today, he is at his happiest watching the young man he recruited to play at LSU who then became a loyal assistant for so many years, finally get his chance to shine as the head coach of the Tigers. There is no doubting Johnny Jones is his own man, but he learned well from one of the giants of the game. Brown is still involved with many of the causes he has always put his heart and soul into and he is continually sought out for speaking engagements and clinics. But now he has more time to watch his grandchildren grow into young adults and to keep in touch with a boatload of players who passed through Baton Rouge in his 25 years. In truth, LSU is inducting a basketball coach into the Athletic Hall of Fame. But the Hall is also inducting a man who has meant so much more to the growth of the game in Louisiana, in the Southeastern Conference and whose beliefs have led him to a colorful, compassionate and fascinating life that many of us have been fortunate to be a small part. The love Dale Brown has shown for LSU gets returned in full Friday night when he is inducted into the LSU Athletic Hall of Fame.